Sometimes it is alright to be selfish. There are certain days that are just all about you during your life. There aren’t many but Saturday night at The Buffalo Bar in St. Joseph, Missouri was one of them for Aaron Blumer. He was stepping out from the band he is in, Borderline, and officially unveiling his first full album, 12 songs of all original songs. Blumer plays a lot of shows in St. Joe and the surrounding areas in Borderline and on his own, so it’s not a situation where the fans needed to see him on this night or they might miss him. Blumer is even a regular at the Buffalo Bar every Thursday night. 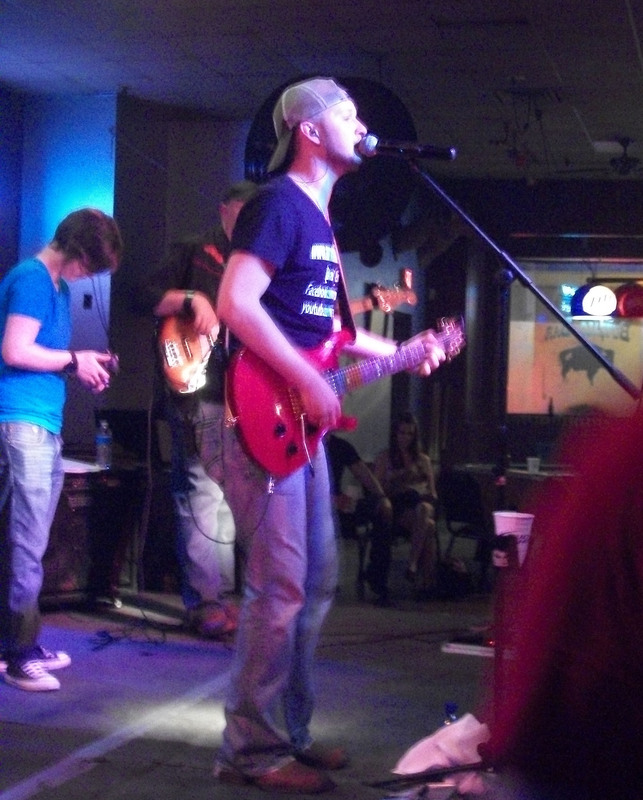 Even with Blumer’s regular shows he still managed to pack one of the biggest venues in St. Joe for his very first album release. Not only was the place packed but all of about the 500 advance tickets were sold out days before the show. 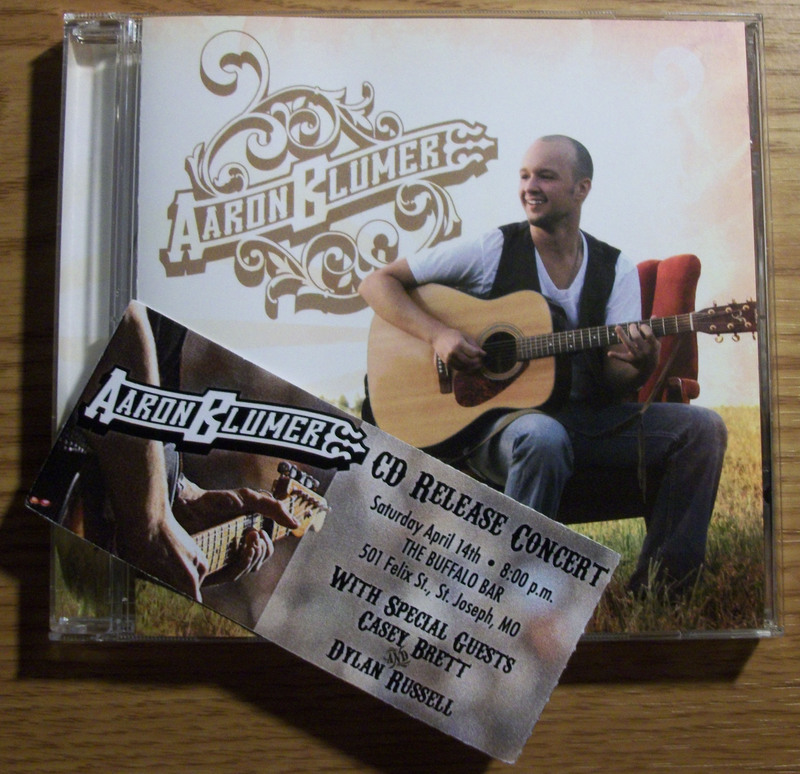 Aaron Blumer's CD Release show ticket with his self-titled debut album. Aaron Blumer would practice some shameless self promotion by wearing a t-shirt displaying his website, facebook and youtube web addresses printed on it, and why not? This night was all about him. With members of his family on stage and scattered throughout the large crowd it would’ve been hard for him not to feel at home in the country bar. His backwards hat wouldn’t give you any indication radio friendly country that comes out when he steps to the mic. The Buffalo Bar is a very large bar that is one big room. It has a dance floor situated in the middle which is normally the focus of the venue on most nights but tonight the focus was on the stage and there wasn’t much dancing at all. Aaron Blumer performing at the Buffalo Bar on 4/14/12 for his CD release show. The most notable cover of the night was Marshall Tucker Band’s “Can’t You See” which educed an automatic mass singalong and fit with Blumer’s original music nicely. Blumer would practice his stage presence by working the crowd with a couple singalongs and the old “have a drink with me” trick, the crowd loved it. After a deserving encore the band would return to the stage to deliver two song encore highlighted by the heartfelt song “The Entertainment.” The merchandise table would benefit from the successful show as it looked like a good amount of the new record and the newly designed t-shirt were sold. This entry was posted in Concert Review and tagged Aaron Blumer, Borderline, Buffalo Bar, cd release show, Country, Missouri, MO, St. Joseph. Bookmark the permalink.